fuzzylite 6.0 is licensed under the GNU General Public License (GPL) 3.0. You are strongly encouraged to support the development of the FuzzyLite Libraries by purchasing a license of QtFuzzyLite 6. QtFuzzyLite 6 is the new and (very likely) the best graphical user interface available to easily design and directly operate fuzzy logic controllers in real time. Available for Windows, Mac, and Linux, its goal is to significantly speed up the design of your fuzzy logic controllers, while providing a very useful, functional and beautiful user interface. Please, download it and check it out for free at www.fuzzylite.com/downloads/. 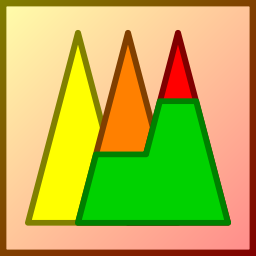 fuzzylite is a free and open-source fuzzy logic control library programmed in C++ for multiple platforms (e.g., Windows, Linux, Mac, iOS). jfuzzylite is the equivalent library for Java and Android platforms. Together, they are the FuzzyLite Libraries for Fuzzy Logic Control. Juan Rada-Vilela. fuzzylite: a fuzzy logic control library, 2017. URL http://www.fuzzylite.com/. **(21) Linguistic terms**: (4) Basic: triangle, trapezoid, rectangle, discrete. (9) Extended: bell, cosine, gaussian, gaussian product, pi-shape, sigmoid difference, sigmoid product, spike. (5) Edges: binary, concave, ramp, sigmoid, s-shape, z-shape. (3) Functions: constant, linear, function. **(7) Activation methods**: general, proportional, threshold, first, last, lowest, highest. **(8) Conjunction and Implication (T-Norms)**: minimum, algebraic product, bounded difference, drastic product, einstein product, hamacher product, nilpotent minimum, function. **(10) Disjunction and Aggregation (S-Norms)**: maximum, algebraic sum, bounded sum, drastic sum, einstein sum, hamacher sum, nilpotent maximum, normalized sum, unbounded sum, function. **(7) Defuzzifiers**: (5) Integral: centroid, bisector, smallest of maximum, largest of maximum, mean of maximum. (2) Weighted: weighted average, weighted sum. **(7) Hedges**: any, not, extremely, seldom, somewhat, very, function. **(3) Importers**: FuzzyLite Language fll, Fuzzy Inference System fis, Fuzzy Control Language fcl. **(7) Exporters**: C++, Java, FuzzyLite Language fll, FuzzyLite Dataset fld, R script, Fuzzy Inference System fis, Fuzzy Control Language fcl. **(30+) Examples** of Mamdani, Takagi-Sugeno, Tsukamoto, and Hybrid controllers from fuzzylite, Octave, and Matlab, each included in the following formats: C++, Java, fll, fld, R, fis, and fcl. //Code automatically generated with fuzzylite 6.0. Alternatively, you can use CMake to build your project linking to fuzzylite. Please, refer to the example application available at examples/application. You can build the fuzzylite library from source using CMake (cmake.org). The files fuzzylite/build.bat and fuzzylite/build.sh are build scripts for the Windows and Unix platforms, respectively. After building from source, the resulting binaries will be located in the sub-folders fuzzylite/release/bin and fuzzylite/debug/bin. The usage of these scripts is presented as follows. For advanced building options, please check the contents of fuzzylite/build.bat or fuzzylite/build.sh, and the contents of fuzzylite/CMakeLists.txt. -DFL_USE_FLOAT=ON builds the binaries utilizing the fl::scalar data type as a float represented in 4 bytes. By default, the binaries are built utilizing -DFL_USE_FLOAT=OFF to utilize fl::scalar as a double represented in 8 bytes and hence providing better accuracy. If fuzzylite is built with -DFL_USE_FLOAT=ON, then the applications linking to fuzzylite also need to specify this compilation flag. -DFL_CPP98=ON builds binaries utilizing C++98 features. By default, fuzzylite is built with -DFL_CPP98=OFF to utilize C++11 features. If compiling for C++98, be aware that you will not be able to benchmark the performance of your engine using the Benchmark class. -DFL_BACKTRACE=OFF disables the backtrace information in case of errors (default is ON). In Windows, the backtrace information requires the external library dbghelp, which is generally available in your system. -DCMAKE_BUILD_TYPE=[Debug|Release] sets the mode of your build. You can only build one mode at a time with a single CMake script. The source code of fuzzylite is very well documented using doxygen formatting, and the documentation is available at fuzzylite.com/documentation. If you want to generate the documentation locally, you can produce the html documentation from the file Doxyfile using the command line: doxygen Doxyfile. The documentation will be created in the documentation folder. After building from source, the following are the relevant binaries that will be created in Release mode. In Debug mode, the file names end with -debug (e.g., fuzzylite-debug.exe). The FuzzyLite Libraries, namely fuzzylite and jfuzzylite, both in version 6.0, are dual licensed under the GNU General Public License version 3 and the Apache License version 2. By default, fuzzylite builds using C++11 instead of C++98. New class Complexity to estimate the computational complexity of an engine. Updated .travis.yml to use Docker, and build using g++ (versions 6, 5, 4.9, 4.8, 4.7) and clang (versions 3.8, 3.7, 3.6, and 3.5). Added appveyor.yml to use continuous integration in Windows under Visual Studio 2013 and 2015. Fixed bug in CloningFactory::deregisterObject(). Bug: Object was deleted before removing it from the map, leaving an invalid object in the map which would cause a segmentation fault. Solution: Remove the object from the map before deleting it. Fixed bug in RuleBlock to reset and clone the implication operator. Bug: implication operator is not copied and reset. Fix: copy and reset implication operator when cloning the RuleBlock. Fixed bug in Function term. Bug: given a formula = "tan(y)" and a map["y"] = 1.0, and executing Function::load(formula), then the map of variables is reset because load() calls unload() first, causing the deregistration of variable y. Solution: Removed method unload() from load(), thereby causing future load() not to reset variables. fuzzylite® is a registered trademark of FuzzyLite Limited. jfuzzylite™ is a trademark of FuzzyLite Limited. QtFuzzyLite™ is a trademark of FuzzyLite Limited. Copyright &#xa9; 2010-2017 FuzzyLite Limited. All rights reserved. Copyright © 2010-2017 FuzzyLite Limited. All rights reserved.